The three graphic images below are customized for Sen. Dean Heller and U.S. Representatives in more than 30 congressional districts. Unfair: The Trump-GOP tax plan gives the vast majority of the tax cuts to the wealthy, rich CEOs and big corporations, not to working families, who are left to pick up the tab yet again. 83% of the tax cuts are going to the richest 1% once the law is fully implemented, including to billionaires like Trump. Unhealthy Tradeoff: How does the Republican-controlled Congress plan to pay for their $2 trillion tax cut for the wealthy and big corporations? By cutting Medicare, Medicaid, Social Security and the Affordable Care Act. Drug companies and health insurers get to pad their profits with big tax cuts, paid for by higher healthcare premiums for working families, while eight million people will lose healthcare coverage. Rigged System: Drug companies, big banks, Wall Street billionaires and their lobbyists have rigged the tax system like they’ve rigged the economy. Their tax breaks are going to wealthy CEOs while millions of families are struggling to get by. The tax rules need to be rewritten to make the economy work for everyone, not just the wealthy few. Broken Promises: Trump promised that corporations would use their big tax cuts to give working families a $4,000 pay raise. He said they would make “massive investments” and stop outsourcing jobs. None of that is happening. Corporate CEOs are not sharing their tax breaks with workers. Wages are stagnant. Corporations are using their tax cuts to buy back their own stock, which lines the pockets of wealthy CEOs and shareholders. It does not benefit workers. 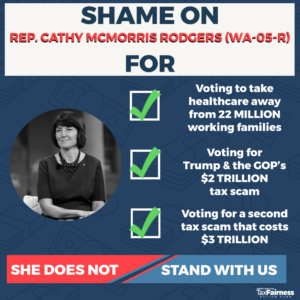 Instead of strengthening and protecting working family priorities such as Social Security, Medicare, Medicaid and education, Rep. [Last Name] first voted to take healthcare away from 22 MILLION Americans by trying to repeal the Affordable Care Act. Then he gave a tax cut costing $2 TRILLION that mostly benefits the rich and big corporations. Then he voted to give EVEN MORE tax breaks favoring the rich that cost $3 TRILLION. These votes show Rep. [Last Name] does not stand with us. Shame on [her/him]! Instead of protecting working family priorities, [@Rep’s Name] voted to take healthcare away from 22M 👨‍👩‍👧‍👦 , give $2T tax cut that mainly helps the rich + big corps, & give another $3T tax cut that mostly helps the rich. 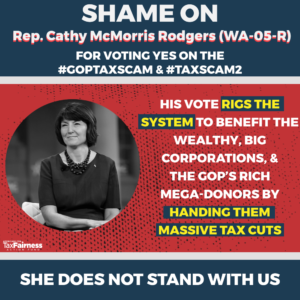 By voting for the #GOPTaxScam last year and its sequel — #TaxScam2 this year [@Rep’ Name] is rigging the system to favor the wealthy, big corporations and the GOP’s rich mega-donors over the needs of working families. Last Name’s] votes are meant to line the pockets of the wealthy and big corporations and now endanger Social Security, Medicaid, Medicare and other vital services. [He/She] does not stand with us. By voting for the #GOPTaxScam & #TaxScam2, [@Rep Name] is rigging the system to favor the rich, big corps & the GOP’s mega-donors over the needs of working families. Last year, [@Rep’s Name] voted to repeal the Affordable Care Act, taking healthcare away from 22 MILLION Americans! Why? To help give the rich and big corporations, including Rx drug corps and health insurers, $600 BILLION in tax breaks. Working families need healthcare to survive. 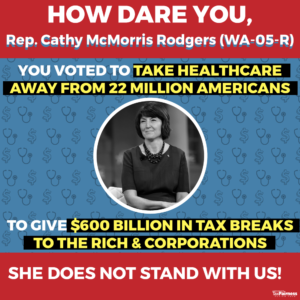 How dare [Rep. last name] try to take it away just to line the pockets’ of the wealthy and big corporations. Clearly, [he/she] does not stand with us.
.@[Rep’s Name] voted to repeal the #ACA, taking healthcare away from 22M people! Why? To give the rich & big corps $600B in tax breaks.